Having come of age in the new millennium, gen Y is the most educated and connected generation ever, but the world they face is vastly different from the one their parents knew, offering few clear or established pathways to a secure future. In Griffith Review 56: Millennials Strike Back, millennials address the issues they face and the world they see with insight and flair. They speak to their experiences: their jobs, housing, health, relationships and the discrimination they face. YASSMIN ABDEL-MAGIED reflects on her experience of conflict and criticism as a social advocate in the public sphere to examine the importance of challenging the status quo and fighting for a better world, regardless of the consequences. ANDRÉ DAO takes a sceptical look at the ambitious promises of new technology to offer solutions to society’s problems. He asks: is it realistic to believe that utopia can arrive via an app? Or do those who look for instrumental solutions to problems of the social simply make things worse? TIMMAH BALL makes an uncompromising assessment of the way Indigenous women in the professional workplace continue to suffer injustices at the hands of white women in positions of authority. In a series of conversations with her sister, MICHELLE LAW considers the sometimes complex, sometimes confusing – but always delicate – negotiations they must conduct between work, family and partners as they take their uncertain place in the world of adulthood. JACK MANNING BANCROFT pleads with members of his generation to ‘start making ourselves a little more uncomfortable’ – to combat disadvantage by extending power to those without it. AIME, the mentoring program he founded as a teenager, is a working example of how personal connection can close gaps in a world of increasing inequality. People are not computers. FIONA WRIGHT takes a personal look at the flaws in treating the body as an entirely measurable and quantifiable mechanism, and how such an approach neglects the essential messiness of being human. Other contributors include: Courtney Landers, Frances Flanagan, Lochie McQueen, Michael Newton, Natalie O’Brien, Amy Corderoy, Bri Lee, Sam Vincent, Sam Carmody, Kavita Bedford, Ashley Kalagian Blunt, Daniel Jenkins, Lech Blaine, Sophie Allan, Keane Shum, Andrew McMillen, Briohny Doyle, David Fettling, Cathal O’Connell, Billy Griffiths, Anna Snoekstra, Jennifer Down, Omar Sakr, Charlotte Guest, Alison Whittaker, Angus Mordant, Godfrey Moase and Sam Wallman. 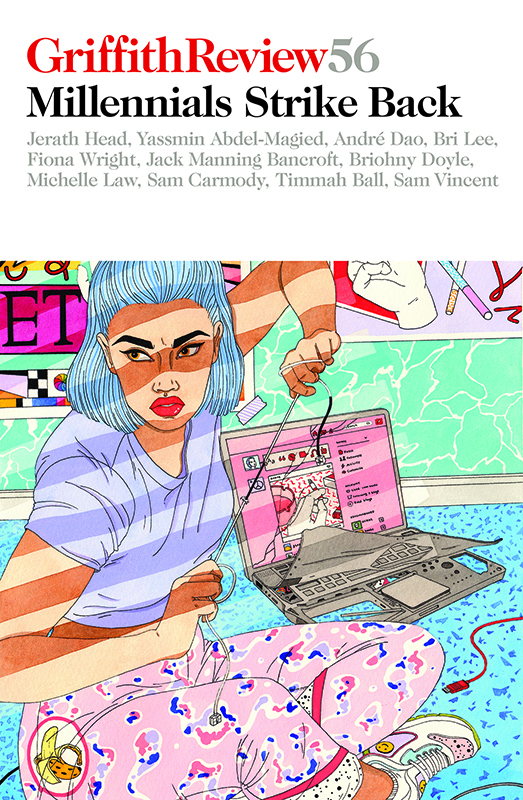 In Griffith Review 56: Millennials Strike Back, co-edited by Julianne Schultz and Jerath Head, the next generation explains itself and speaks to the issues that define them. Griffith Review 56: Millennials Strike Back is published with the support of the Australia Council for the Arts.